Flattering50: Wedding Style: What to Wear to “Black Tie Optional”? Wedding Style: What to Wear to “Black Tie Optional”? A Flattering50 reader recently emailed and wrote: "I’m going to a wedding in December and the invitation says ‘black tie optional.' How should I dress?” There's no getting around it: ‘Black tie optional’ signals that a formal affair is planned and that family, friends and honored guests are encouraged to dress up. For women, appropriate formal attire consists of either an evening gown or a fancy cocktail-length dress or glamorous suit. If you occasionally attend black tie affairs, such as fund raisers, you may have an evening gown or two already in your closet. For the rest of us, a dressy suit or cocktail dress may be the more reasonable choice. For a BTO wedding, the dress ought to be glamorous. Long gowns often look very glamorous on the red carpet at the Academy Awards ceremony. However, on those rare occasions when I've tried on evening gowns in recent years (over 50), I've felt rather frumpy. I'm much more comfortable in a cocktail dress. The cocktail dress should be made of a lux material, such as silk. For a winter wedding in a cold climate, a rich velvet dress or a dress with some velvet might be the perfect choice. 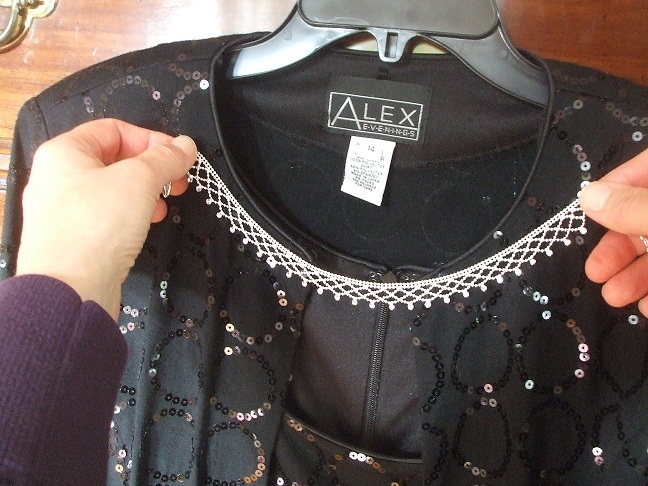 Special details, like beads or sequins in the same color as the dress, are also luxurious looking. 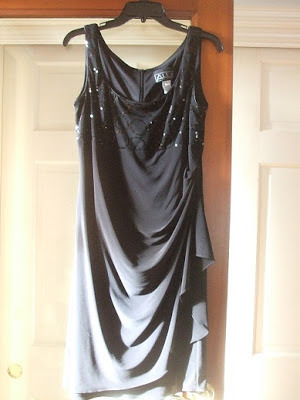 My friend's dress has black sequins as well as lovely draping, which creates an elegant look. Since cocktail dresses are often sleeveless, over 50 women may wish to find a dress with a matching jacket. A dressy suit with a skirt is also appropriate and keeps your arms covered. shopbop.com has lots of gowns and cocktail dresses. Charlie Jade Silk Chiffon Dress ($162) looks like a comfortable dress and one that you could have fun glamming up with sparkly accessories. -- I love dresses with asymmetrical designs on over 50 women. Take a peek at Nightway Beaded Trim Side Draped Dress . A glamorous top over a long dark skirt in a rich fabric is also appropriate. For those women over 50 who have given up on dresses and skirts, certain dressy trousers might suffice. For instance, you might try on a glamorous top over a long, flowing pair of black crepe trousers. A pair of heels and other dressy accessories will complete the look. However, I would consult members of the wedding party to gauge the appropriateness of dress slacks, regardless of how nice yours are. -- You'll find a Prelude Godet Illusion Inset Skirt and a Prelude Velvet Palazzo Pant . Dramatic accessories are a great way to insure that your attire is formal enough. A sparkling necklace like the one my friend chose to wear is a perfect example. My friend tends to wear understated jewelry and wasn’t about to get really “splashy” for the wedding. She found lovely costume jewelry—earrings, a necklace (below) and bracelet—which added a bit of glamour to her outfit (and didn’t break the bank!). As I wrote in my recent post, Glittery Shoes Say "Special Occasion," glittery shoes are the hot trend for evening affairs in my area. A strappy shoe or shoe with a cut-out toe might be more practical. 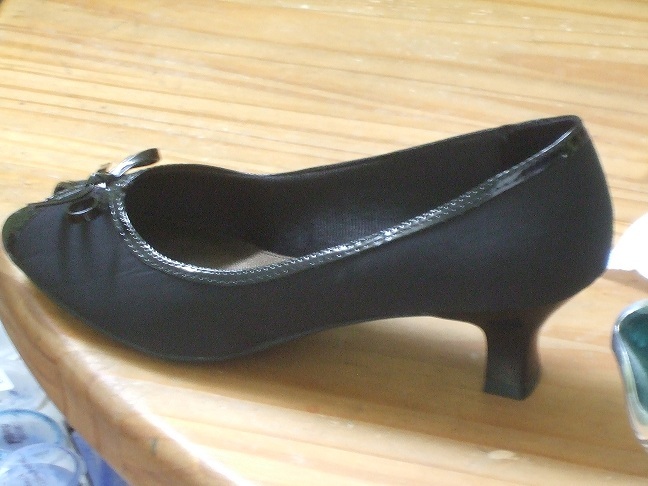 The heel should be comfortable for a long evening of dancing. My friend chose a shoe with patten leather trim. 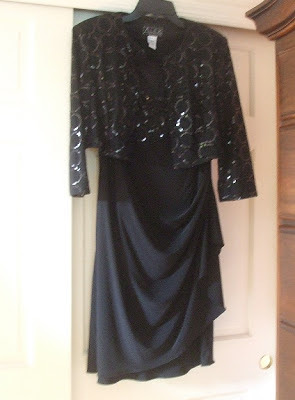 She thought the shoes complimented the black sequins on her dress and jacket. I agree. A clutch purse is a simple solution and one that never seems to go out of style. 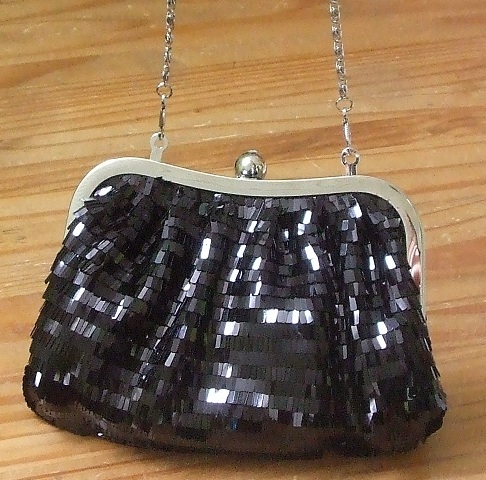 Again, you want to find something dressy, like my friend's beaded bag. I have a simple velvet clutch that I use all the time. Depending on you and your dress up budget, you might want to think about your hair and makeup. There is nothing that makes me feel more glamorous than a great blow out!